Location: the Amboseli National Park is situated on the border with Tanzania. This is an ideal park for photographers as you can take pictures of the big game with Africa's highest mountain in the background: the Kilimanjaro. Tourists combining Kenya with Tanzania, usually enter Amboseli from the Namanga side, using the 80 km dirt road that leads to the Meshanani Gate. The drive from Nairobi to Amboseli is about 5 to 6 hours if you use the tarmac road that goes to the Iremito Gate. Amboseli is often combined with the Tsavo West National Park. A dirt road of about 100 km links the two parks, making it possible to reach the other park in time for lunch. Amboseli is below 1200 m above sea level. Landscape: Amboseli consists mainly of open savannah with some acacia forest and the Kilimanjaro in the background. 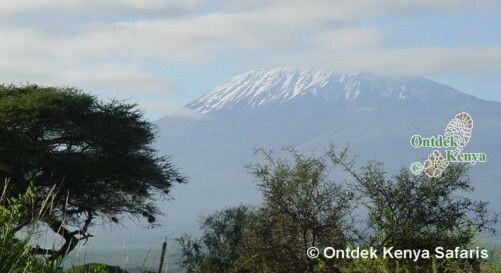 This extinct volcano, which is in Tanzania, is up to now still covered with glaciers. However, due to global warming, these glaciers have already decreased substantially and will in the near future melt down completely. This will definitely have a big impact on the vegetation (and the wildlife as a result of that) of the Amboseli National Park. What is known as Lake Amboseli has been in the recent years no more than a dusty sand pan. In the heart of the park there's swamps fed by sulphur springs with a wide range of water birds and even hippos. Mammals: e.g. the big five (= elephants, lions, buffaloes, rhinos and leopards), spotted hyenas, Masai giraffes, Burchell zebras, hippos, wildebeests and gazelles. In the vast savannah the game is usually easy to spot. Bird species: more than 400 different bird species have been registered. Human traffic: Amboseli is one of the most visited parks in Kenya. A lot of tourists staying at the coast make a combination of Tsavo and Amboseli. 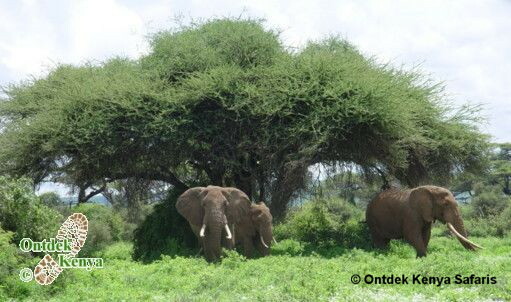 During high season (= the holiday season in Europe), it is often busy in Amboseli. Activities: this is an ideal place for doing game drives, bird watching and photography. 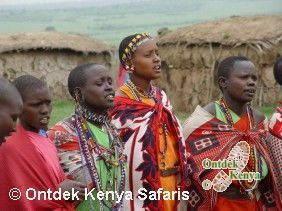 Lots of people visit a Masai village (= manyatta) to see how the Masais still live up to now the way they have done this for the past many centuries. Accommodation: there's a wide range of lodges and tented camps within and in the proximity of the park. We prefer the very luxurious Ol Tukai Lodge, which is in the middle of the park. A more budget-friendly option is the Kilima Safari Camp, on the border of the park. For school groups, the Kibo Safari Camp is definitely an option. For tourists seeking a cheaper option there's the self-catering KWS bandas. Good to know: the park is accessible by plane from the coast and Nairobi.